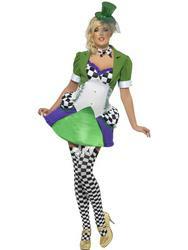 You'll have everyone going mad for you when you arrive dressed in this Alice in Wonderland inspired costume. Included is a colourful and extrovert dress, the bodice is decorated with silver panels, silver stitch detailing and black and white check board trim. The puffed out skirt is decorated in bright blue and green coloured panels. Completing the costume is a cute red jacket with silver coloured sleeve trim and a stylish black and white checked neck tie. 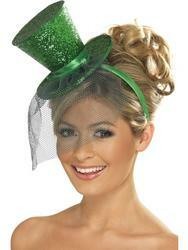 Sure to have you looking like the hottest hatter at any book or film themed fancy dress party. Black and white checked neck tie.